The Amplify® nugget is a high-fat extruded nugget that offers about 2,000 calories per pound and helps put added weight on horses and improves their hair coat. It contains a proprietary blend of vegetable oils, rice bran and flax seed and is highly palatable. Whether you're getting ready for competition or are traveling with your horse, sometimes they need an added boost to gain a healthy amount of weight. Additional factors such as stress, the time of the year or prior nutrition can also influence a horse’s weight loss or lack of breadth. 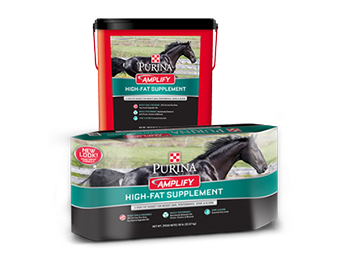 An added supplement like the Purina Amplify Nugget can help get your horse back on track to a fuller, healthier weight.